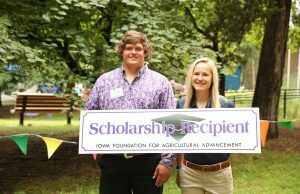 Every year, the Iowa Purebred Swine Council supports the Iowa Foundation for Agricultural Advancement (IFAA) by funding two $1,500 scholarships, awarded to outstanding youth involved in the swine industry. IFAA is a non-profit organization comprised of livestock enthusiasts dedicated to encouraging 4-H and FFA members to pursue ag-related careers. IFAA is responsible for the annual Iowa State Fair Sale of Champions and scholarship program. 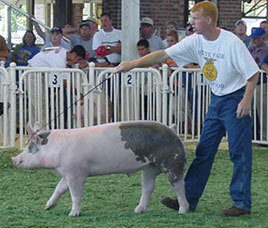 The Iowa Purebred Swine Council provides nearly $11,000 in premiums to youth swine exhibitors. The IPSC provides additional premiums to 4-H and FFA swine exhibitors to encourage youth to show purebreds at the Iowa State Fair. 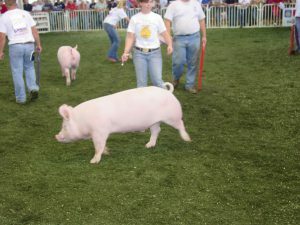 The award money, which is funded through the Pork Checkoff program, is in addition to the premiums provided by the Iowa State Fair and is distributed in both the Market Hog and Derby Shows. 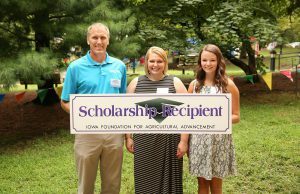 The Iowa Purebred Swine Council sponsored five scholarships from this event. This program is designed to recognize FFA swine project members who can articulate their understanding about the future of the animal industry and their knowledge about animal production. This event is for FFA exhibitors who have completed their junior or senior year in high school. 2016 scholarship winner Luke Worden and IPPA Producer Outreach/Federal Policy Director Stephanie Carlson. Johnathan has demonstrated his passion and commitment to the swine industry through collegiate activities and through his own herd back home. As an Iowa State University animal science major, he led Bacon Expo as the treasurer for two years, served as a chair for the new swine jackpot show, is a College of Agricultural and Life Sciences ambassador, and a member of the ISU Livestock Judging team. He also has served on the Homecoming Central Executive Committee. Johnathan is very invested in his family’s spotted purebred and show pig operation. He spent the summer as a traveling sales territory intern for ADM, where he marketed multi-species feed. Johnathan hopes to translate this to a full-time opportunity to give farmers an outlet to trust with major decisions in their operation, as well as his own. Luke has been successful in academics, sports and showing pigs. He has received numerous awards, including the Chicago Trip, Danforth Leadership and AK-SAR-BEN Achievement Awards, and the Swine and Diversified Livestock Proficiency Award. He also earned his Iowa Degree. Luke is a 5th generation livestock producer and has taken great pride in his family’s show pig and purebred operation. He enjoys exhibiting pigs all across the country, making breeding decisions for his herd, and assisting customers to help them succeed. Luke enjoys learning all aspects of the industry and knows furthering his education in the agriculture industry will help better his own operation. He plans to attend Iowa Western Community College, majoring in Agriculture Business/Agriculture Transfer. 2016 IPPA President Al Wulfekuhle and scholarship recipients Ashley Smeby and Holly Cook. Very few are fortunate enough to realize their passion at a young age, but Holly has. Her dedication to the pork industry began as a youngster with her active role in the family’s farrow-to-finish hog operation. Selected as the Iowa Pork Producers Association’s 2016 Iowa Pork Queen, she is embracing the opportunity to “agvocate” to those unfamiliar with modern pork production, by sharing her passion and experiences to exert a positive influence on the industry. Holly has served as treasurer, vice president and president of her FFA Chapter, as well as president of her 4-H Club. Throughout high school, she remained involved in sports, music, student council, National Honor Society and tutoring. Holly is a freshman at Iowa State University majoring in agricultural business. Growing up on a commercial swine farm, Ashley learned very quickly the importance of a strong work ethic and responsibility. Her involvement of exhibiting swine at local, state and regional levels has peaked her interest to improve her family’s hog quality through genetics, feed management and nutrition. Ashley is majoring in agronomy at Iowa State University and staying actively involved in her swine roots. She was a 2016 Iowa Pork Producers Association Youth Aambassador and continues to advocate for the agriculture industry as a whole through her blog, “The Journey by Ashley.” At Iowa State, she is active in Block & Bridle serving as committee chair and treasurer. Sigma Alpha Delta, Dance Marathon, Iowa State Corn Growers Club and the Bacon Expo are other ISU activities.